With mottled brown feathers, the woodcock is nearly invisible as it sits fight among the dry leaves of the forest floor. Short, rounded wings enable it to fly through dense, shrubby cover. Large eyes set far back on the head provide a wide viewing angle. Its long prehensile bill has a flexible tip which aides in grabbing food while probing through moist soil. The male weighs approximately 5.3 ounces while the larger female averages 7.0 ounces. In addition to a larger body size, the combined widths of the three outer primary wing feathers is wider in females than in males. Breeding: Southern Newfoundland west to southern Manitoba south to Florida and Texas. Winter: Southern New Jersey and the Ohio Valley to Florida and Texas. Woodcock arrive back in New Hampshire from mid-March to mid-April and make their southward fall migration in October. Though earthworms make up 50 to 90% of the diet, larvae of beetles, flies, and other insects are consumed when available. Ants, moths, snails, and seeds from various plants are occasionally taken. Woodcock perform a unique courtship display at dawn and dusk upon arrival on the "singing grounds" in spring. To court females, the male flies upward in fight, spiraling circles creating a twittering sound with its outer primary wing feathers. At the height of its flight, the male flies steeply downward, landing close to its original position. After each flight the male emits a series of nasal "peents." Males repeat this performance 10 to 20 times during an evening. Woodcock spend nights roosting in fields. At dawn they return to nearby feeding areas. Nests are usually located within 300 feet of the singing grounds in young hardwood stands. Four eggs, laid in a shallow depression in the leaf litter, hatch in 19 to 22 days. Young woodcock are precocial, hatched completely feathered with eyes open, ready to run at any sign of danger. Sexual maturity is reached in one year. In contrast to other members of the sandpiper family, which typically inhabit inland and marine shorelines, woodcock are adapted to wooded environments. Woodcock require four different habitat types. Clearings are used by males for courtship display. Moist, fertile soils with alder or dense second growth hardwood offer feeding areas. Young, second growth hardwood stands provide nesting and brood rearing habitat. Large fields are needed as night roosting sites. It's important to have all four habitat elements in close proximity. Woodcock were common in New Hampshire during the peak of farm abandonment. Old fields reverting to forest are ideal woodcock habitat. This process of natural succession can be slowed down or reversed to attract woodcock back to an area. Feeding cover - moist, rich soils with abundant earthworms and overhead cover. These characteristics are generally found in 10 - 20 year old alder swales and some young hardwood stands. Strip cuts will help regenerate these sites. Singing grounds - forest clearings, agricultural fields, orchards, and hay fields adjacent to feeding cover are needed for the spring courtship ritual. Nesting cover - woodcock nest in young, open second growth stands usually within 400 feet of a singing ground. Roosting areas - at dusk woodcock move from their daytime feeding cover to roost at night in fields of at lease 3 acres. Sepik, G.F., R.B. Owen, and M.W. Coulter. 1981. 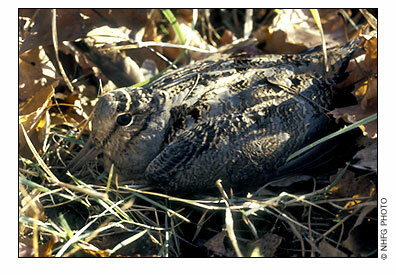 A Landowner's Guide to Woodcock Management in the Northeast. U.S. Fish and Wildlife Service Misc. Report 253. Williamson, S.J., and D.E. Langley. 1992. 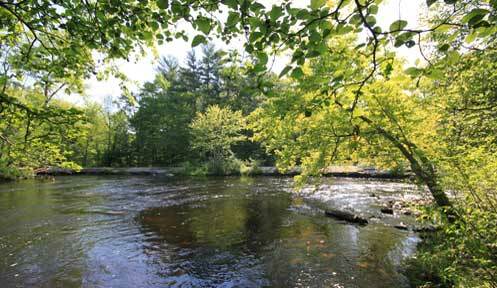 Forester's Guide to Wildlife Habitat Improvement. 2nd Edition. UNH Cooperative Extension.